Become the ultimate hunter in Chillingo's thrilling action game. 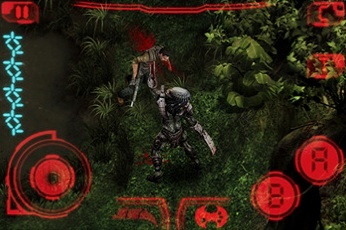 We're huge Predator fans, so when Chillingo announced that it had released an iPhone game based on the upcoming Predators film, we were a bit skeptical. Most movie licensed games fall short, so we feared that the publisher and Angry Mob Games would do one of Hollywood's greatest aliens a huge injustice, but we were wrong. Predators is one of the best third person action games out there, and well worth the $2.99 asking price. First, you can forget about playing as those pesky humans and focus on slaughtering them as one of the most efficient hunters of all time. The Predator comes equipped with all of its incredible toys, including the wrist blades, shoulder cannon and combi stick. In addition, you can cloak to avoid detection, and go infrared to better see your prey. Chillingo placed the camera from an isometric perspective, and you explore the different environments using the on screen d-pad. To attack, you mash the A button to unleash wrist blade slashes and devastating combos, and block with B. When you press both buttons, the game lets you perform a grab, where you can either rip humans to pieces or tear off their heads to save as trophies. It's a simple to use and effective control scheme. Pressing both A and B at the same time, however, is a bit tough, since you can't feel those buttons, and need to change the position of your hand to access them. Otherwise, you should have no trouble slicing and dicing flesh. That is, unless the humans put up a fight. The game doesn't have a huge variety of bad guys, but the snipers, machine gunners and knife wielding maniacs will give the Predator all it can handle, especially when several of them attack at once. Bottom line, prepare for a fight. Then, after you've won, you can compare your achievements with others via the Crystal leaderboards. One of the best things about the game, though, is the impressive attention to detail. 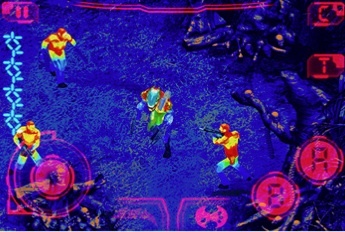 Fox gave the Predator's signature sound effects to the devs, including the audio whenever it activates infrared and the explosive noise from the shoulder cannon. It's great stuff. Now factor in the equally hot graphics, with full Predator armor, jungle locations and a trophy/weapon room, and you have a cool App that belongs on your iPhone. All of this makes Predators a must own. Not only is it one of the best movie licensed games out there, but it's also a sweet game in general. The blood, the attention to detail...just buy it now. What's Hot: Excellent use of the Predator license, challenging gameplay, lots of gore, online leaderboards. What's Not: On-screen buttons make combos a bit challenging to pull off.